Here are the step by step instructions for making the macramé bracelet. This is super easy–do not be afraid newbie crafter! Stiff Board (I use a canvas panel from an art supply store) that is marked off in inch increments (great for all kinds of jewelry projects). Silver Beads or others of your choice (make sure the holes are the correct size for the string you will use). I like to use prayer beads and pearls too. The Bead Chest is a great source for a wide variety. They are on etsy and also have a web site. Silk Cord–Mine came from Etsy. A bead/stone/object to use for your end finding. I am using a beach stone that has been drilled. Etsy find once again! The supplies all lined up and ready to go! 1. Cut the wax cord to 12″. Thread thru your end finding and tie 3 knots to secure at the end of your wax cord. The wax cord will be the middle of your macramé. Drilled Beach Stone finding. Wax Cord tied in 3 knots to secure. You can glue the knots now for extra security. 2. Now string the silk cord through the hole in the finding. I needed to use a stiff wire to help poke mine through to get it started. A needle might help. Pull the silk cord through until the bead/finding is in the middle. Tie your first macramé knot, with the wax cord in the middle. Use this YouTube video to acquire or refresh your skills! The point is to try to cover up the ugly knots you’ve just made! I am using the brown wax cord to show the contrast for illustration. For “looks” use a wax cord that is close in color to your silk. Silk cord threaded through the finding–ready to start the knots! 3. Keeping the wax cord in the middle, you may want to do 4-8 macramé knots before you attach the bracelet to the board with your clip. Beginning of bracelet clipped to the board. 4. Now comes some creativity and decision making. Knot as many as you like, depending how many beads you will use. I did 6 knots, then clipped the extra wax cord that was still sticking out that formed the short strand. I will end up using 10 beads. So, I did my 6 knots, added a bead. Then two more knots. One in each direction. (or as many as you like to get the space between the beads you like). Maintain your pattern. Add a bead. Knots. Bead. Knots. Etc. Until 6″ long for a 7″ bracelet. Most bracelets are between 6 1/2″ and 8 1/2 “. Wrists vary almost as much as ring sizes! Progression of beads. I will add 10 all together. 5. When you are at the very end of your Bead/Knot pattern, you need to secure the wax cord by knotting it with the silk cord. I knot the wax cord with one side of the silk cord, then cross it over to knot with the other silk cord. Try to tie the knots so the wax cord ends up in the middle again. Then I tie a knot or two in the wax cord as close as possible to the end of the bracelet. You can put a dab of glue on this knot now for extra security. Tie as many macramé knots as you need to match the pattern at the opposite end of the bracelet. I had 6, remember? Then trim the wax cord so it is no longer sticking out. Extra knots made in the middle for security. 6. Remove the bracelet from the clip. 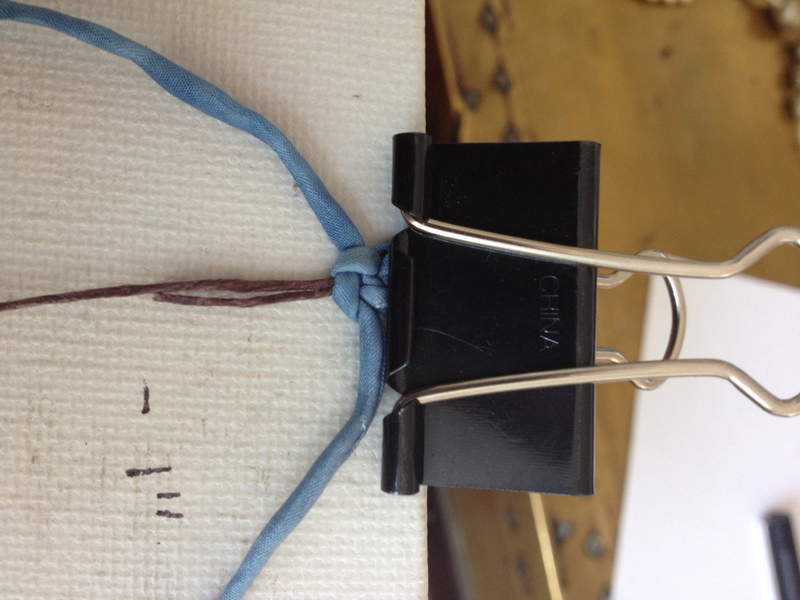 Tie two knots at the end with the finding between the silk cords—this will make the loop to put your finding through. Do this twice to get an adjustable bracelet if you are selling it or making it for someone whose measurements are uncertain. Shows the two loops plus the knots at the end of the silk cord. Voila! You are done! Two bracelets ready to wear! 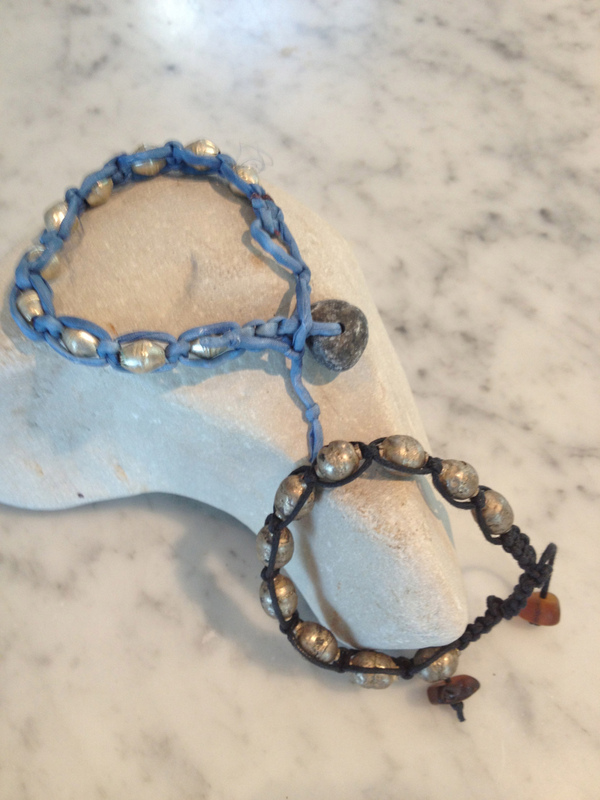 Top bracelet is the one we just made–blue silk cord with silver metal African beads and a beach stone end. The other is made with black waxed cotton and Ethiopian prayer beads. The closure is the adjustable slide closure as shown in the YouTube video. The ends are finished with two pieces of beach glass.